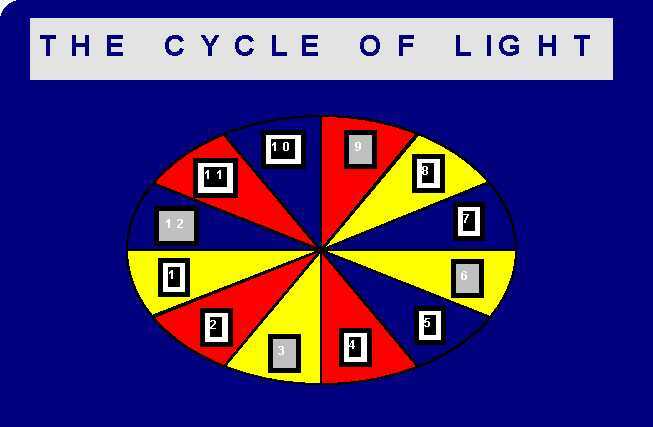 The Cycle of Light is the Zodiac cycle, numbers 1-12 sequentially, which you already know has the Star of David in it. When the Cycle of Darkness is contrasted to the Cycle of Light a system of 1584 cycles reveals themselves. What this means is that the #7 is stationary within its own sector. When this stationary #7 is capitalized on it produced a series of 11-cycles within its sector. When I discovered this system of contrasting the Cycle of Light with the Cycle of Darkness I found that there were many different sectors to this system of cycles. The cycle just before the Cycle of Darkness I have come to call the Cycle of Hell. The fact that I was able to designate the first verse of Genesis as the #8, in the "Cycle of Darkness" that overshadows the entire First Chapter of Genesis, was a bit prophetic in a way. It would seem that the archetypal pattern that dominates the creation schema insist upon the #8 associating itself with the #2. Notice how after Christ is born 8-days later he is circumcised. This is 2-years from the star first being seen. When the letter BETH appears in the Torah 8-words appear in the first verse of Genesis. Most people would count 7-words, but, the Zohar tells us that the word BERESHITH is two words: "Bara Shith = created six", making it 8-words. Let me advise the reader that my astrological orientation of the words of the first two verses of Genesis is well thought out. Each word is placed according to its own persona. Heaven = 2, Earth = 3: these two because of their days. Spirit is #1 because it represents God as in "God is a Spirit" as Saint John says. Elohym sits between the Heavens and the Earth as the word Bara suggest. The #4 represents water and therefore is "without form". The #9 represents death and there is "void". The manner in which the symbolism of the words began to play out was suggestive that "eth" represented #11. January is the "darkest month" and therefore #10. The word "deep" reminds us of "deep six" and when we see "Darkness on the face of the deep" how else are we to number it. Also in a circle #10 is 270 degrees from #1 making it its opposite in sine waves. The #10 represented Capricorn: the Goat that fed the Elohym (gods). When we look at the "#8 & #5" it was not a difficult choice to call them waters. The 2nd Day tells us these waters are to be separated. The entire first chapter of Genesis has 31-verses split into 17 (8) verses in the first four days and 14 (5) verses in the rest of the chapter. This and other examples outside the Bible convinced me of the sacred scriptures being the waters the spirit of God hovered over. The first four cycles up to the end of the 3rd Day of Creation is all Ive been able to Astrologically orientate as far as the words go: Cycle of Darkness, Cycle of Light, Cycle of Heaven, Cycle of Triplicities. The Cycle of Light and the Cycle of Heaven teach the Quadruplicities: Cardinal, Fixed, & Mutable. The Cycle of Light has 8-words that are astrological orientated to the Cardinal & Mutable signs, and the Cycle of Heaven has 4-words that are astrologically orientated to the Fixed signs. Flick these two cycles interchangeably. The Cycle of Triplicities (3rd Day) will demonstrate the patterns of the Earth, Air, Fire, and Water signs in groups of threes. Those that follow my method need no further instructions. The cycle of Hell has no words to orientate (that I know of). I first had a hint that there was something before Genesis from Saint Augustine's Confessions where he says, "I won't say what one author said 'God was creating Hell before He created the Heavens and the Earth, rather I would say he was doing nothing". Augustine doesn't tell us "to do nothing and to create Hell" are synonymous. I learned from the good Nuns in Sunday school "an idled mind is the devil's workshop." Only after I discovered the Cycle of Hell did I realize what Saint Augustine was speaking of. 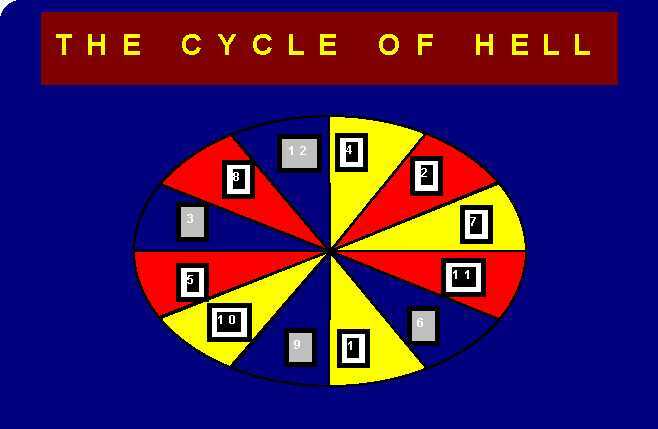 When this Cycle of Hell is viewed from the Solar calendar not from Astrology as in the Cycle of Light, the Star of David's pattern appears by noting the Quadruplicities: Cardinal, Fixed, and Mutable, signs of Astrology. They take on the same numerical pattern illustrated above with the Star of David in the calendar: 1, 3, 6, 8, & 2, 4, 9, 11, & 5, 7, 10, 12 (using the Quadruplicities as its guide). When I saw this evidence of the anti-Christ in the cycles I knew that I had the evidence I needed that the Star of David was meant to be seen in this familiar pattern. I now had concrete evidence that the calendar pattern produced on January 1st 8 BC was no accident. It was well planned and it would appear that the creation of Christianity was a plan of the group that penned the Torah. Note the pattern of the Star of David: one from the Zodiac and the other from the Calendar perspective. There now can be no doubt that Christ was born at the dawn of creation that set into motion the Gentile religions of the world. The fact that Christians believe that December 25th is the day that Christ was born is a belief based upon the mythology of Christianity. The fact that April 1st is the day designated as Christ conception date in the Nativity story would indicate that the Christian myth was meant to coincide with the reality of the dawn of creation. The Pythagorean Comma was introduced to me via Robert Temple's work on the Sirius Mystery. Anytime I am apprised of a new idea such as the Pythagorean Comma I test the Genesis Text concerning it. One of the things that intrigued me was that the 360-degree circle coincides with other data that I ascertained concerning the planet Uranus. I can only tell you that the discovery that the Old Testament, in and of itself, represented the circuit of the planet Uranus around the sun was quite startling. Hershel discovered Uranus in 1783 AD. How would early writers of the sacred text have known of such calculations, especially, when the planet cannot be seen with the naked eye. Yet, Dante Alighieris La Divina Commedia implies the seven planets (which includes the Sun & Moon) were within the confines of such an orbit even though Uranus is not expressly mentioned in his work. The Greeks had their mythos declaring that Orouranos married Earth. The fact that I was able to obtain three diverse calculations to bare on the Uranus calculations, to me, was astonishing. Finally, to learn of the Pythagorean Comma and my application of it on the 360-degree circle was a fluke. The circle represents the soul. But those that have ears to hear know that the first word of Genesis tells us all we want to know abut the Pythagorean Tetractys. It was prophesized that he that understands the Pythagorean Tetractys will understand the keys to the universe (see Manly P. Halls "THE SECRETS TEACHINGS OF ALL AGES" pg. #68 The Cube & the Star). The first word of Genesis, the Zohar tells us, represents the six directions. The six directions are what a cube or a sphere is all about. We already know that Bereshith creates the Star of David. Another enigmatic secret concerning our topic in the sacred scriptures and astronomical wonders is the alignment of September 14th 1186 AD. On that date the Sun, Moon, & planets were all within alignment. Exactly 135-years later Dante Alighieri would die. The mystery here is that Dante wasnt born until 79-years later. At the age of 35 (1300 AD) he began writing his work La Divina Commedia and completed it 21-years later in the year of his death. These same mathematics are born out in his work. You may say, "this is all well and good, what does it have to do with the sacred scriptures?" The answer is in the details of the first eleven chapters of Genesis, where the name of God (Elohym) is mentioned 35-times before the phrase Yahweh Elohym is mentioned. Then the names of God: Yahweh & Elohym are mentioned 100-times: 50-Yahweh & 50_Elohym. Exactly 21-times the phrase Yahweh Elohym is paired. So it is actually 79-times the name of God is mentioned unless you take into account the 21-times the two names are paired together to give us 100-names: 50-times each. Ask yourself this question: how does the Genesis writer know of a date in 1186 AD? 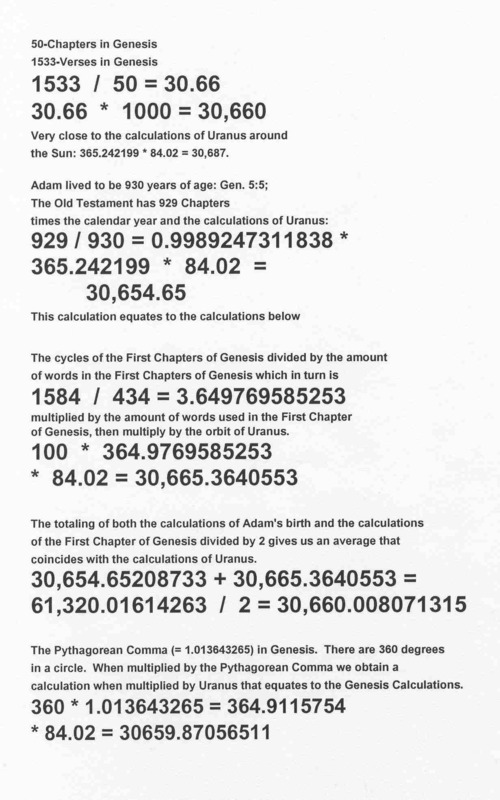 Or if he doesnt know it, how does a day out of random time collaborate such precise mathematics in the book of Genesis? It is these kinds of proofs that convince me of the hand of God in the sacred scriptures. The Date of September 14, 1186 AD can be confirmed in the first issue of the Encyclopaedia Britannica (old spelling) issued in 1771 (vol. #1, pg #494 see event #64 [previously called "The Dictionary of Arts and Sciences]). I have attempted almost the impossible with this paper on the Birth of Christ. I have tried to bring to those that will read it the secrets and the mysteries of Genesis. I wanted to demonstrate that the Birth of Christ has little to do with a date out of the end of the BC era somewhere in time on December 25th 7 BC. The reader has probably figured out for himself by now that Christ was born once and for all times, in the material world, at the Dawn of Creation. Christs symbolic tale, in esoteric parlance, is eternally being refreshed in our daily lives (activities). We have seen this repeated over and over again with the first letter of Genesis: BETH, which is an archetypal pattern of everything that will be created past, present, and future. This means that for the Christian era Christ could not have been born on December 25th 7 BC from a physical point of view but from an esoteric (hidden symbolism) one he was. This is not heresy by any means. Those that have ears to hear let him hear. Those who have followed my thought pattern throughout this paper have probably guessed already that every child that comes into the world, male or female, is the Christ child. It is what each does with the gifts of the Magi that is the determining factor whether that child becomes a devil or an angel: the son of darkness or the son of light. I also recognized that this paper is written in the 1st year of the 3rd millennium, where it was prophesized that there would be the return of Christ on the 3rd Day after his death ("a day is as a thousand years with the lord"). I personally am not ushering in the 2nd Coming of Christ because Christ never left us. But ask yourself, why is this knowledge becoming available at this time when in previous times it was not as clearly available. It has been lost for so long. Sometimes I feel that I have torn from the heart of creation its most cherished possessions: its secrets. Yet, my soul could not have survived in a world where there was no possibility of knowing the truth about God. Such a prison sentence would have been unbearable to endure. The argument above explains itself to those that have followed it. I agree that to many it is a new perspective on an age-old problem concerning the birth of Christ. But now we are at the conclusion and those that have come this far have made up their minds one way or the other. There is no more I can say on this issue to convince the naysayers one-way or the other. The reason for this 'Conclusion' is to answer the question, WHY? Why, does the sacred scriptures hide its most valuable information? The answer is not cloaked in the scientific and precision data embedded in the sacred scriptures rather it exist in what is outside of the sacred scriptures. I believe that the rudiments to the scientific knowledge that can be conceived by man, past, present, and future, is embedded in the sacred scriptures. It is inherent in the symbolism of the world but is record spiritual in the sacred scriptures for those that want to see it and to know it. No knowledge can be discovered, anywhere in the future, that is not already recorded in the sacred scriptures esoterically. Why God did this I believe was to give evidence to the spiritual man that anything the politicians do and say, and anything the academic and religious communities do or say are nothing compare to what the sacred scriptures have already declared. The sacred scriptures are far more intelligently written than what the authorities in the mundane world have to offer. In a very clear sense mortals are being told that there is an end to knowledge that can be known by the material man. What is also very clear is that there is nothing that we can know about God. Nothing. Absolutely nothing. All that mortals, that believe in the sacred scriptures, can possibly know is that though we can know nothing about God he is present in our lives. We know that he is our home and though we don't know what we shall be we shall be even as he is. This is precisely what saint John us in his 1st letter. I can only promise that in the future I will put up a comprehensive website covering all of my researches. This paper is basically a grand overview, in a nutshell, of my belief system concerning the Christian religion. As you can see I am not afraid to explore and to demonstrate those concepts and ideas.